Tuesday, September 6, 2pm – talk by Gordon Gilfether on Stobs Camp, near Hawick, which served as an army, internment and prisoner-of-war camp from the before the First World War until the late 1950s, when it closed. Friday, September 9, 7.30pm – Real Time, a Borders-based Scottish folk band with a repertoire that includes not only many songs and tunes, from both sides of the border, but also contemporary and self-penned material. Advance bookings from 01750 32396. Every Tuesday, 10am-2pm – library. Members have been busy this summer. Nine went on the outing to Kirkharle Craft Centre and then Belsay Hall and Gardens. This was followed by a social evening, and then SWI neighbours were invited to a fun social and quiz night. The quiz was won by a joint team from Bowden and Langshaw, with the hosts runners-up. St Boswells landed the wooden spoon. Competition – a summer dessert – 1 (equal), Karen Fagan and Sue Dodds. The church was almost packed again on Sunday as Malcolm and Mae Cardill reaffirmed their marriage vows. They were married 50 years ago, also in Caddonfoot, by the Rev Donald MacCuish. The service was conducted by minister Elspeth Harley. The Bible reading was performed by Fay Brydon, and music played by Andy Bird and Anne Grieve. Bible study resumed last week in Trinity Church office. Copies of the harvest newsletter are in the process of being delivered ahead of the Sacrament of Holy Communion on Sunday. Earlston’s annual Community Day will be held on Sunday, September 4, at the rugby club, running from noon-4pm. 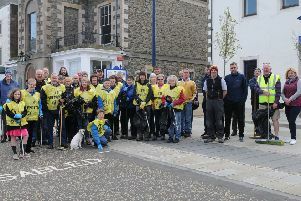 The event showcases the variety of volunteer-led groups running in the village. They host activities, provide information about themselves and seek potential new members. This year’s theme is Borders historic buildings. Attractions include the annual community bike rideout, starting at 1pm, as well as Messy Church, tug of war, live music, raffles, tombola, inflatables and refreshments. New this year will be jousting on bikes and an opportunity to try archery. There will be a special Community Day service at the parish church at 10.15am. The wedding dress exhibition held last weekend raised £435. The service on Sunday, September 4, at 10.15am will be conducted by the Rev Julie Rennick. The congregational board meet on Monday, September 5, at 7.30pm in the church hall lounge. The next service in Hanover Lounge is on Tuesday, September 6, at 3pm. Tonight (Thursday) at 8pm sees the opening night in the church hall. There will be a talk on interior design by Geoff Williams, while Tania Helm has a stall with some gifts and items to buy from Bank House Living in Lauder. Vet charity PDSA is returning to Borders with its national pet wellbeing tour this month, offering free health MOTs for local dogs. The charity’s PetCheck vehicle visited a number of locations in the area earlier this year, and is now returning to offer further expert pet care advice, free health checks and reduced cost microchipping. Events will be held at a number of locations, from 9.30am-4.30pm, including: Thursday, September 8 – Public Park, Abbotsford Road, Galashiels. Appointments must be booked in advance by calling 0800 917 2509. People affected by diabetes are invited to join a new support group organised by Diabetes Scotland in the Borders. An information meeting has been arranged for 11am on Saturday, September 10. It will be held at the Brother of Charity Services Scotland, Trieste House, Bridge Street, Galashiels. The gathering is free to attend and refreshments will be available. M&S Galashiels and Macmillan Cancer Support are joining forces again in a bid to raise more money than ever before for the charity’s flagship fundraising event, World’s Biggest Coffee Morning. M&S has supported this since 2010 and during this time the retailer has netted more than £6million for Macmillan. On the day of the coffee morning – Friday, September 30 – every customer who has an M&S Sparks Loyalty Card and has selected Macmillan as their chosen charity will be granted a double donation – from 1p to 2p – on each transaction. And from today (Thursday), M&S shoppers will be able to enjoy a whole host of tasty treats in M&S Foodhalls, with 10% of each sale going to the cancer charity. Galashiels Scottish Country Dance Club resumes on Tuesday, September 13, in Old Parish and St Paul’s Church Hall at 7pm. Potential new members welcome. For further information, contact Marion on 01578 730591. Bill Cheyne welcomed the congregation to the Sunday morning service which minister Elspeth Harley conducted. Dorothy Howden led music. The Rev Harley referred to the church’s Gift Day on Saturday, September 3, and encouraged everyone to be generous. Nessie Amos read the Bible lessons. Choir rehearsals resume today (Thursday) at 7pm. New members welcome. On Saturday, September 3, there will be a coffee morning in the church hall between 10am and noon and those who have received Gift Day envelopes and letters can return them then. On Sunday, September 4, there will be a service at 11.15am. A concert of fiddle playing, with piano and guitar, by Gordon Gunn, Brian McAlpine and Marc Clement will be held in Glendouglas Hall on Saturday, September 10, at 7.30pm. Booking essential via email – glendouglashall@btconnect.com. Members meet again after the summer break on Wednesday, September 7, at 7.30pm when Ian Landles will give a talk (his choice of subject). Competition – a limerick. Gordon Flower Show takes place in the village hall on Saturday, September 3 (doors open 3pm). August 23 – 1. George Graham and Bob Francombe; 2. Valerie Johnstone and Marion Miller; 3. equal Sam White and Richard von Slicher, Lance and Tricia Witten. At last week’s meeting, president Jim Walker anounced the death of Harald Willner at his home in Effingham, Kingston-upon-Thames, Surrey, during the night of August 21/22. Harald, a retired businessman, had a holiday flat in High Street and for the past 10 years had been a regular visitor at the club. He was a member of Kingston-upon-Thames Rotary Club and was last year made an honorary member of the Hawick club. The evening took the form of a business meeting. Linden Warburton, international convener, anounced that two schemes, one for £250 and the other for £200, were in place in Malawi for the finance scheme for two women’s businesses selling beads and groceries which helped them to support their families. Gus Neilson (foundation) reported that support was being given to a hospice, along with Grahamstown Rotary Club, South Africa. Vet charity PDSA is returning to Borders with its national pet wellbeing tour this month, offering free health MOTs for local dogs. The charity’s PetCheck vehicle visited a number of locations in the area earlier this year, and is now returning to offer further expert pet care advice, free health checks and reduced cost microchipping. Events will be held at a number of locations, from 9.30am-4.30pm, including: Friday, September 9 – Wilton Lodge Park, Hawick. Appointments must be booked in advance by calling 0800 917 2509. Innerleithen Horticultural Society open show is on Sunday, September 4, in the Memorial Hall from 2pm. The hall will be open the previous day from 6.30-8pm and on show day, from 7-10am, for entries. The next meeting of Innerleithen and District Community Council will take place on Monday, September 5, at 7.15pm in the council chamber, Memorial Hall, Leithen Road. St Ronan’s School is having a collection of unwanted clothing, shoes, soft toys and bedding. Items can be handed into the school in bin bags on or before Wednesday, September 7. The items will be transferred into cash for the parent-teacher association. Innerleithen Church of Scotland will hold a coffee morning in the church on Wednesday, September 14, from 10-11.30am in aid of the twinned congregation in Thondwe, Malawi. The next meeting of St Ronan’s Border Games committee will take place on Wednesday, September 14, in the Burgh Chambers, Memorial Hall, at 7pm. St Ronan’s School Parent-Teacher Association holds a coffee morning on Saturday, September 17, in the Vale Club from 10am to noon. St Ronan’s Border Games annual family 5k fun run takes place on Saturday, September 17, on the Tweed Valley Railway Path, commencing 2pm. This is a fundraiser for Games Week 2017. Sponsor forms are available from the Thrift Shop or St Ronan’s School. Please telephone 01896 490510 for more information. Innerleithen and District Amateur Operatic Society is presenting ‘Guys and Dolls’ from March 27-April 1. First rehearsal will be on Wednesday, September 21, in the Free Library Hall, Buccleuch Street, at 7.30pm. Contact 01896 830577 or secretary@idaos.org.uk for more information. St Ronan’s Band presents a concert featuring the Band of Her Majesty’s Royal Marines Scotland in the Memorial Hall on Saturday, September 24, at 7.30pm. Tickets are on sale from KJBelleville@aol.com, Thrift Shop, Adam’s Bakery and Robb’s KeyStore (Peebles). The services on Sunday, September 4, will be at 8.30am (breakfast, song and story) and 10.30am. The next session will start on Monday, September 19, at 7.30pm in the coffee room, Abbey Row Centre. It will feature a quiz night with Peter Small. Competition – decorated book cover; fun competition – fancy pen. Subscriptions are due that night, when the new syllabus will be given out. Abbey Quilters meet on Tuesday, September 13, at 7pm in Abbey Row Centre when Margaret Thompson is bringing some of her appliquéd quilt tops. Those attending should bring their new year’s membership forms and a mug. For further information, contact Rineke Sangster 01573229414. Cheviot Youth, with the help of Kelso Wheelers and The Fitness Academy, are running two new, free courses. To book a place on either or both (introduction to mountain biking, starting on September 9, and Fitness Max, starting on September 5), email Ian on ianrendallreid@cheviotyouth.co.uk for a booking form. Wednesday, August 24, results – match-pointed pairs – N/S – 1. Rena Stewart andBeth Stark; 2. Jean Henry and Myra Thomson; 3. Bob Stevenson and Annie Mitchell; E/W – 1. Mary and Jim Stone; 2. Christine and Ian McCreath; 3. Chris Anthony and Vanessa Wilson. August 25 – teams – 1. Val Johnstone and David Harris-Burland, Gerry Eglington and Jon Bridger; 2. Mary and Nigel Lindsay, Marion Miller and Chris Anthony; 3. Rena Stewart and Maureen Weightman, Shirley Armstrong and Moira Ayton. A charity ride-out took place in aid of the local branch of Macmillan Cancer Relief, and the amount raised was £6,100. The event was organised by Robert Rae and Kenneth Dickson, and 38 riders participated. The mounted group went over much of the route that would have been used by the reivers of old. They headed from the town by way of the Round House and Fairy Loup to Gilnockie Tower, and made their way back by Old Irvine over a total of 14 miles. Thanks go to Neil Stevenson and the Stoneypath Trust for its sponsorship, and to the public who made donations. Among the many others to be thanked by the organisers are the various farmers and Buccleuch Estates for use of their land, Castle Craigs Club for the use of equipment, marshals, both on foot and horseback, and back-up vehicles, and Ian Martin for access to Gilnockie Tower. Local MP David Mundell is currently on his annual surgery tour and tomorrow (Friday) will visit Eskdalemuir, Bentpath, Ewes, Gilnockie, Harelaw, Rowanburn, Canonbie and Evertown. He will be at Eskdale Agricultural Show in the town on Saturday, September 24, from 1-4pm. Numerous townsfolk made their way to Canonbie for the annual village flower show which was in its 120th year. The weather was not very kind as it rained for much of the afternoon, which affected some of the events on the playing field. There was around 1,000 entries for the various class in the hall, with many familiar names among the winners. Langholm pipe band led the vintage parade and fancy dress floats from the Cross Keys to the field, and the also entertained later in the afternoon. On the Thursday prior to the show, the annual pet contest took place, judged by Charlie Foster of Border Vets, who gave advice to owners and everyone received a prize. There was – for the first time – a scarecrow competition, open to anyone within a five-mile radius of the village. It drew an entry of 26 which were in various locations and admired by many who passed by in cars and buses. Members last Wednesday heard Mary Sherrard give a fascinating, lively and stimulating talk about her wartime service in the WRNS at Bletchley Park, working at decoding the German Enigma secret signal machine. Not only did she tell of the importance of the work, but gave a detailed technical description of how British scientists and mathematicians managed to break German codes in what was one of the most important secret operations of the Second World War. Services will be held on Sunday, September 4, at Channelkirk (10am) and Lauder (11.30am), and led by the worship team. Later that day, a summer evening songs of praise will take place at Channelkirk at 6.30pm. Maxton Meets is a series of talks, open to all, held in the village hall from September to April. The next gathering is on Monday, September 12, at 7.30pm when Gordon MacDonald will discuss the history of the Borders textile industry in an illustrated talk entitled ‘Tweed to Twinsets’. hall, Weirhill, on Saturday, September 3, from 2-4.30pm. There are classes for flowers, fruit and vegetables, floral art, baking and craftwork, plus a children’s section. Telephone entries to Carolyn on 01835 823994, or email bowercarolyn@yahoo.co.uk. With the coming of autumn, thoughts turn to the Trimontium Celebrity Lectures, all in the Corn Exchange on Thursdays at 7.30pm. On October 6, Stratford Halliday, prehistoric archaeologist and field researcher, will speak about the project that brought about the ‘Atlas of Hillforts in Britain and Ireland’. The speaker has promised to take in the Eildons. Dr John Reid, chairman of the Trust, is presently engaged on another summer’s dig at Burnswark in Dumfriesshire. After his recent trip to Germany, he will be visiting Israel where archaeologists will be helping him to compare the Burnswark set-up with that at the famous Masada hillfort. On October 13, he will be drawing his conclusions by presenting ‘From Burnswark to Masada, and Governor Lollius Urbicus’. On October 27, Professor Ian Armit, of Bradford, speaks on another hillfort, ‘An inherited place: 800 years of settlement at Broxmouth’. This East Lothian excavation was done in the 1970s and the report has only recently been published, thanks to the speaker’s determination, which saw the recruitment of three young archaeologists and fundraising which enabled them to write up this extraordinary site with its curious buildings. The first meeting of the session is on Wednesday, September 7, in the Corn Exchange at 7.30pm when the demonstrator will be Sandra Halkett from Elgin, with ‘Autumn Joy’. Visitors welcome. Tweedbank Art Club is holding its annual exhibition in the Ormiston Rooms, Melrose, from September 9-13 (10am-4pm daily). A sponsored walk from the Kelso Sainsbury’s store to the Templehall Hotel was held on Saturday when more than 60 people took part. This was followed by a meal, disco and raffle, held in the Templehall, in aid of Breast Cancer/BGH Macmillan Centre. Organiser Jean McNulty thanked everyone who walked, the hotel for the meal, Ryan Borthwick for the disco and everyone who donated raffle prizes. The event, to date, has raised about £5,700. A Cheviot Churches fete will be held at Mainhouse on Sunday, September 4 (11am-4pm). Worship at 11am, with barbecue and teas to follow, and retirement presentation to the Reverend Robin McHaffie at 3pm. The fly-fishing competition was won by Drew Gibson. Newtown and Eildon Seniors’ Afternoon Club restarts after the summer break on Tuesday, September 6, in Newtown Community Wing at 2pm. Vet charity PDSA is returning to Borders with its national pet wellbeing tour this month, offering free health MOTs for local dogs. The charity’s PetCheck vehicle visited a number of locations in the area earlier this year, and is now returning to offer further expert pet care advice, free health checks and reduced cost microchipping. Events will be held at a number of locations, from 9.30am-4.30pm, including: Wednesday, September 7 – Kingsmeadow Road car park, Peebles. Appointments must be booked in advance by calling 0800 917 2509. At a blood-donor session held in Peebles on Sunday, August 21, a total of 191 volunteers offered to give blood and 196 donations were given. There were 12 new donors. Souter Quilters begin their new session on Wednesday, September 14, meeting from 7-9pm in the Argus Centre. Members gather on the second and fourth Wednesdays of the month. The September 14 meeting will be a sewing and registration evening – the next sees guest speaker Joanna O’Neill on the topic of ‘Bite-Sized’. Future speakers/workshops include Susan Briscoe, Melanie Amos, Anne Donald, Ann Hill and Gail Lawther. New members welcome. For more information, contact Cathy Coutts on 01750 21632 or email cathycoutts@icloud.com. Sprouston Kirk has a new organ. It will be consecrated by interim moderator, the Reverend Douglas Nicol, in a joint service with Kelso Old Parish Church in Sprouston Kirk on Sunday, September 4, at 9.30am. Want to act, help backstage, or are just interested generally in plays, poetry or literature? If so, come to the Upper Room of the village hall from 7.30-9.30pm on Thursday, September 1, to discuss the winter programme. The first meeting of the Stitchil SWI’s new session will be on Tuesday, September 6, at 7.30pm in the village hall when Margaret Riddle and friends from Charity Begins At Home (CBAH) will talk about their visit to London for the Queen’s 90th birthday party. Competitions – small vase of red, white and blue flowers; coronation mug. The next service in Traquair Kirk will be on Sunday, September 11, at 10am. Oyster Theatre is holding auditions for Peter Pan in the Public Hall on Sunday, September 11, at 2pm and Tuesday, September 13, at 6pm. Wanted by director Sue Tickner are actors, dancers and singers – of every age and experience. She is putting on the panto in late November. Any queries, contact 07766 910050 or oysterprod@aol.com. The next service in Walkerburn Public Hall will be on September 18, at 10am. Celtic musicians Outside Track will perform in the Wauchope Hall on Friday, September 9, at 7.30pm. Tickets – the village shop or Susan Stewart (420231). Cheviot Churches will hold a garden fete at Mainhouse, Morebattle, on Sunday, September 4, preceeded by a church service at 11am. There will be a presentation to the Rev Robin McHaffie at 3pm, marking his retirement. There’s a live link to the annual guild gathering on Saturday, September 3, in Yetholm Church from 10.30am-3.30pm. There will be a meeting of the festival committee in the Youth Hall at 7.30pm on Monday, September 5. Quiz nights in The Plough begin again on Wednesday, September 7, at 8pm – proceeds to the Wauchope Hall. The pavilion fun day and fundraiser – despite afternoon rain – realised in excess of £3,000 which will be distributed between the pavilion refurbishment, Edinburgh University cancer research and the Great North Air Ambulance.